India's Hardik Pandya routed England with his maiden five-wicket haul in Test cricket and then urged pundits such as Michael Holding to assess him on his own merits after the West Indies great said he was "nowhere near" becoming the "next Kapil Dev". 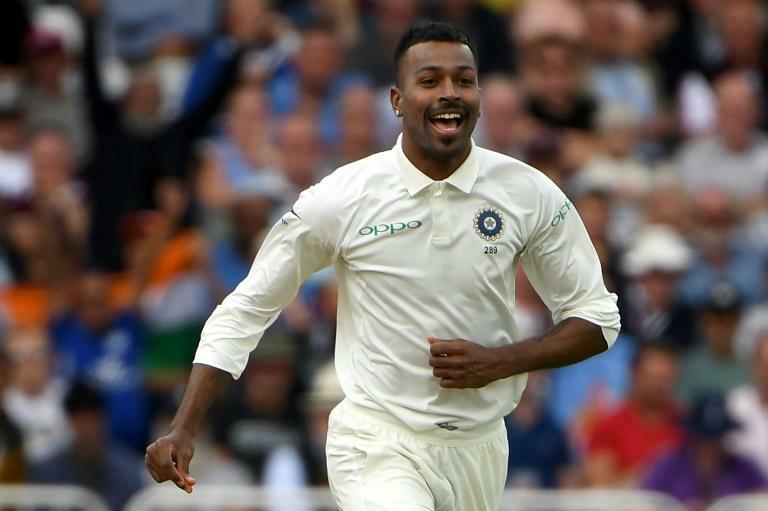 Pace-bowling all-rounder Pandya, playing in just his 10th Test, made the most of the swing-friendly conditions on offer to take five for 28 as England collapsed to 161 all out at Trent Bridge on Sunday. India then pressed home their advantage to be 124 for two at stumps in their second innings, a commanding lead of 292 runs on just the second day of the third Test. "I have never wanted to be Kapil Dev," Pandya told reporters. "Let me be Hardik Pandya, I am good at being Hardik Pandya, I played 41 ODIS and 10 Tests being Hardik Pandya, not Kapil Dev." Prior to this match, the 24-year-old Pandya was averaging 32 with the bat and 39 with the ball in Test cricket. That led West Indies fast-bowling great Holding to suggest India needed to "find someone who can contribute a lot more to this team right now." Holding made his remarks during an interview with the ESPNcricinfo website on Thursday -- two days before the third Test started -- in which he insisted Pandya was a long way from becoming a world-class all-rounder in the mould of India great Kapil. The now 59-year-old Kapil scored 5,248 runs at 31.05, including eight hundreds, during a 131-Test career that yielded 434 wickets at 29.64 as well for the fast bowler. Kapil was also India's inspirational captain when they beat two-time defending champions West Indies, who had Holding in their XI, in the 1983 World Cup final at Lord's -- one of cricket's all-time stunning upset victories. Before the second Test at Lord's last week, which India lost by the huge margin of an innings and 159 runs to fall 2-0 behind in this five-match series, Pandya had gone four Tests without a wicket. "I don't think he does a lot with the ball," said Holding. "He is not consistent." Holding, now a respected television commentator who is covering the England-India series for Sky Sports, insisted "I heard a mention, when I was working in South Africa: 'he is the next Kapil Dev'. I ain't going to tell anybody he's not going to be the next Kapil Dev, but he is nowhere near there yet. "And they (India) need to find someone who can contribute a lot more to this team right now." But having made his mark at Trent Bridge, significantly as a fourth seamer in a rebalanced attack following the return of fast bowler Jasprit Bumrah from injury, Pandya said he had no interest in being compared to great players of the past. "They (the players of Holding's generation) have created their era, let me be Hardik Pandya, let's stop comparing me with anyone," he said. "My team is happy with me. Nothing else matters." England were bowled out in a session on Sunday despite an opening stand of 54. Having gone nearly 80 years without losing all 10 wickets in a Test session from 1938 to October 2016, Sunday's slump was the third time it had happened to them in 22 months. They might have been made to follow-on before Jos Buttler top-scored with 39 to ensure India would have to bat again. "It's very disappointing...being 50 for none," said Buttler. "We let that slip." Buttler explained that while there had been some "very honest conversations" in the dressing-room, there was no "magic answer" that would bolster England's frail top-order. The vice-captain to Joe Root, asked if England understood why they kept collapsing, replied: "Obviously not, if it keeps happening. Rightly, people say it's been happening too often -- which it has." "Guys have got to improve," Buttler added.